as molecular biology or recombinant DNA techniques. Macromolecules- there are four main classes of macromolecules: lipids, proteins, carbohydrates, and nucleic acids. Deoxyribonucleic acid (DNA)- double helix chains of paired bases containing thymine, cytosine, guanine, and adenine. 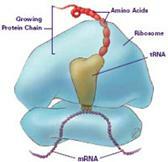 Ribonucleic acid (RNA)- the intermediate between DNA and proteins. Proteins- chains of amino acids coded for by genes in the DNA. DNA is transcribed into RNA and special pairing of bases dictates which sequence is made. 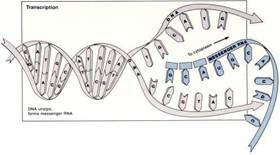 DNA replication- is the process in which a strand of DNA makes an identical copy of itself. DNA repair- a complex set of enzymes proofread DNA and repair brakes in the double helix. DNA recombination- is the mixing of genetic material from two chromosomes as a result of crossing over. Interphase– duplication of genetic material. Prophase– condensation of chromatin into chromosomes. Metaphase– binding of chromosomes to mitotic spindle. Anaphase– separation of chromosomes into opposite sides of the cell. Telophase– reformation of cell and nuclear membranes. Actin– composed of actin polymes, important for cellular locomotion and contraction of muscle cells. Microtubules– composed of tubulin poymers, important for vesicle motilty and separation of chromosones during cell division. Intermediate filaments– composed of proteins such as keratin and lamin, important for cell adhesion and signaling.